Get ground handling services at Kochi (Cochin) Airport, India at the most competitive price. Send a query. Distance & Direction from City: 28 Kms North East of Cochin 045 Deg. Aviation Services India through its tieups with best ground handling companies makes available ground handling services at Kochi (Cochin) Airport (VOCI/COK), India to all Private Jets, International and Domestic airlines. 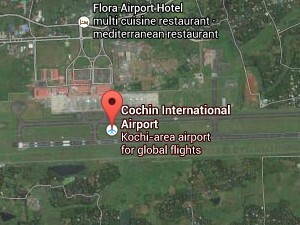 Contact us for best ground handling companies, at Kochi (Cochin) Airport (VOCI/COK), India. Kochi, also known as Cochin, is a major port city on the south west coast of India by the Arabian Sea and is part of the district of Ernakulam in the state of Kerala. Get ground handling services at Kochi (Cochin) Airport (VOCI/COK), India. Send a query.